Sensational Summer Programs at the Center! This Summer is all about Communication Development! In addition to the great services offered at the Center, many Summer Programs will be offered as well! These programs include…. 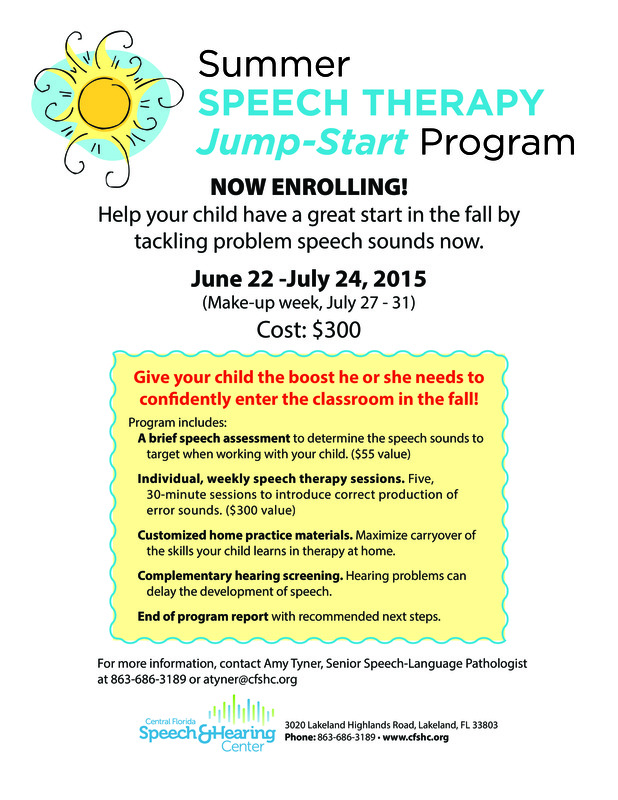 Give your child the boost he or she needs to confidently enter the classroom in the fall! NOW ENROLLING! Maximize carryover of the skills your child learns in therapy at home. Hearing problems can delay the development of speech. End of program report with recommended next steps. Why Wait to Communicate?? Sign language enhances a baby’s language development by allowing them to learn and play with language before their speech develops. Space is limited… call today! Classes are fun, social and educational! This program is designed to encourage the joys of reading or being read to! Call 863-686-3189 for more information! Did You Hear? May is Better Speech & Hearing Month! May 12th Stroke Support Group meeting to cover Stress Management & Relaxation Techniques! The Central Florida Speech and Hearing Center Stroke Support Group now meets the Second Tuesday of the Month at 1:00 p.m. in the Ruthven Family Community Room located at 3020 Lakeland Highlands Road in Lakeland. May 12th meeting will focus on Stress Management and Relaxation Techniques. The CFSHC Stroke Support Group provides the opportunity to meet and share experiences with family members, caregivers and others. The support group has been established to provide education, advice, and self-help skills, as well as new potentials and possibilities. Meetings are FREE and open to the public. To learn more about the Stroke Support Group, please contact Tina Bell at 863.686.3189. 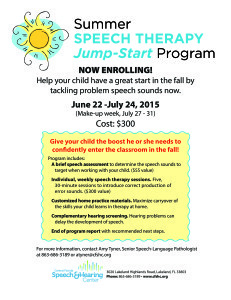 Summer SPEECH THERAPY Jump-Start Program coming to Central Florida Speech & Hearing Center! Give your child the boost he or she needs to confidently enter the classroom in the fall! the skills your child learns in therapy at home. delay the development of speech. – End of program report with recommended next steps. Click here to view the official flyer for more details! The Center is proud to welcome our new Audiologist, Dr. Ben Russell! Dr. Russell earn a Doctoral degree in Audiology (Au.D.) from the University of South Florida in 2010. He completed his clinical externship with the Carolina Ear and Hearing Clinic, an Otology group located in Raleigh, NC. He provides diagnostic testing for both hearing and balance disorders. Dr. Russell is an active researcher at the University of South Florida, where he is a Ph.D. candidate. His current work involves sound and speech perception by adult cochlear implant listeners. FREE Amplified Phones Available at Nearby Locations in June! Never Miss a Word with a FREE Amplified Phone! Thank You to All that Supported the WOCF Spring Fashion Show! Thank you to everyone that came out to support the 2015 Women of Central Florida Spring Fashion Show last night! We’d like to recognized our 38 amazing women that participated… Melony Bell, Ashley Bell Barnett, Whitnie Bell, Bell, Joni Finkbeiner, Janet Albritton, Liz Antaya, Donna Pearce, Kathy Abels, Gwinnell Brant, Allison Beeman, Aileen Figueroa, Anna Bostick, Ashleigh Broadus, Carol Mitchell, Diane Giordano, Elaine Goddard, GG Golden, Joy Pedersen, Juli Surface, Lauren Schwenk, Lauren Giordano, Perry Oakley, Tiffany Alfonso, Teresa Olinger, Misty Peacock, Madalyn Kissel, Melinda Herrin, Marsha Gotro, Brianna Burton, Kristin Burton, Ally Robare, Michelle Robare, Michelle Broxton, Danita Farnsworth, Andrea Oliver, Danica Fields, and Lynn Browning! Our Fashion Partners: Chico’s, Southern Posh, M. Marie, and Hattie’s Branches! Our Beauty Team: End Results Salon Spa, Professional Appearance Makeup, & Fantastic Sams! Our Live Auction Partners: Sheriff Grady Judd, Kathy Abels, the Barnett Family, and Dudley Rayborn! And all the wonderful businesses that donated items for our silent auction!